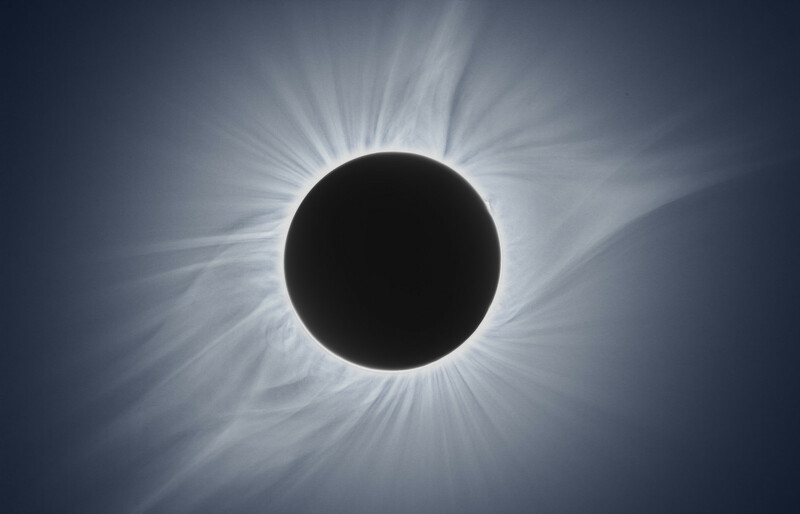 Corona Picture, finally <dusts hands off> - SolarChat! It was a surreal experience. I am very envious of my wife. Her birthday was August 21st and she got an eclipse as a present! If the opportunity is there, I'll trek to the path of totality in 2024. I can only imagine what tech will make life easier then. Smartphones weren't around when I took my first astrophoto! Fabulous image, Chris. You've captured lots of wonderful detail here. Superb result. Any chance of a detailed explanation of your equipment, settings and processing technique? The picture was from a HDR composition(sec) 1/4000, 1/1000, 1/250, 1/60, 1/15, 1/4, 1”, 4" exposures although I didn't use the 4" exposure. Magic Lantern is great for bracketing and completely automates the sequence. A few more tweaks in Photoshop and this gives the result above. However, I still haven't figured out how to add the prominences. I really wanted to join you and the other veterans of Solarchat but the logistics weren't there. Are you considering the eclipse in 2024? BTW, love your Ha work! Heck, everyone's work here covers about ever nook and cranny of the event. That is a fantastic image, Chris, well done ! Thanks for the details, Chris. Sharing info is what makes this site so great. Thinking about 2024 for sure. Wonderful detail Chris. One of the best results I've seen so far. Wow! well done! did you use the first method? That's a super shot of the Corona Chris!